I've been using EQ since version 3. I draw my own blocks all the time, including improv blocks/scrappy pieced. They've made lots of improvements on cutting diagrams over time. Accurate yardage estimates still need a bit of work, depending on the shapes you're cutting (i.e. triangles convert to a rectangle.) 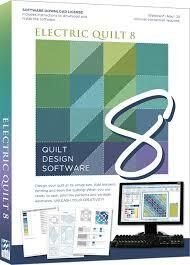 I don't publish patterns, but many designers do use EQ. It's easy to export images, though if you want to add something like arrows for pressing, you'd need to use another program to add them. Wish I could help, but I still use paper and pencil. Electric Quilt is great with support. Lots of books, blogs and classes on line. I think you will like it. I have EQ7 and love it. I bought it when it first came out ...taught myself to use it. I rarely buy patterns preferring to create my own so EQ is perfect. My favorite thing about it is being able to test out color placement. I change my colors over and over until I get a look I like. It has been worth every penny! I just ordered EQ8 and a lesson book. I can't wait to get started. It takes 10 hours to drive (one way) to EQ Academy in Ohio, so I'm going to try learning from the book first. This looks like fun. I forgot to mention the great support from EQ, there is yahoo group and you can also contact them directly. I went through both a free and paid (only $25) tutorial session from onpointquilter.com. I learned some useful things. EQ8 doesn't come with a printed reference book - there is online help, I would recommend getting a basic book and walking throuh it. Thanks so much. I've ordered the software and a basic lesson book. I'll keep you posted on how it goes. Can't wait to get started!